Here's a quick and delicious lunch dish! It takes almost no time to whip up, and it's really nice. You can make it healthier by using whole-wheat pasta, and low-fat cream, but it's up to you really. The cheese I use is Västerbotten, which is a Swedish cheese that I wrote more about here. It's recently been released in a new packaging, a small wedge much like parmesan is usually sold here. As Västerbotten is great in food, this is a nice idea. If you don't have it available - which you probably won't if you're not in Sweden, use some parmesan or pecorino, it'll be delicious too. Boil the pasta. Boil the florets in salted water until just tender, then immediately transfer to a bowl of really cold water so that the cooking stops. This helps retain the beautiful green color, and the texture gets better. Fry the bacon until crispy. 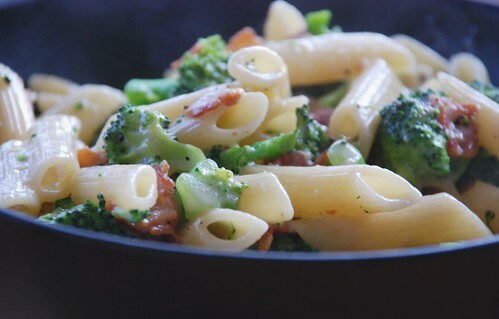 Add the garlic, cooked broccoli and cream, and leave to cook for a minute or two. Drain the pasta but reserve some water. Mix the pasta with the sauce and the cheese, season with black pepper and use a little bit of pasta water to get the right texture - the sauce should be silky, not stodgy. IKEA in the US sometimes carries Vasterbotten in their food shop and I've been known to make a long detour there just to get this totally scrumptious cheese. I've never cooked with it because it's so yummy just on its own, in thin slices on flatbread. Good to know that it melts into a silky sauce -- though I'm not sure I can bear to spare a crumb for even a delicious-looking recipe like this one. Chanterelle - oh, that's good to know! I've had some people e-mail me and ask about it. I'll send them to IKEA then! Birthe - thank you so much :) I just visited your blog and added it to my reader, it looks great and I can't wait to read more. Good way to practise my rather non-existent Danish, too.